← NATIVE ALUMNI REUNION PLEASE JOIN US FOR AN INFORMAL POTLUCK GATHERING TO HONOR THE LEGACY AND FUTURE OF THE NATIVE PROGRAMS AT EVERGREEN. ( left to right Raven Redbone and Falcon Sison. -Altern8ive shotz photography). Falcon is a Culture Keeper. Falcon drums, sings, weaves,and learned how to make paddle’s & rattles. Falcon has been around ceremony his whole life, when called he shows up and does the work for his community. Falcon has been clean for 2 years & 7 days & counting. Falcon is apart of the Canoe Way and has participated in various ways of life & ceremonies. He continues to keep learning his ancestral ways of life. Falcon currently works with the Leschi Heritage Foundation @ the culture center with his Tribe. Falcon is happily married to Tyler Sison. 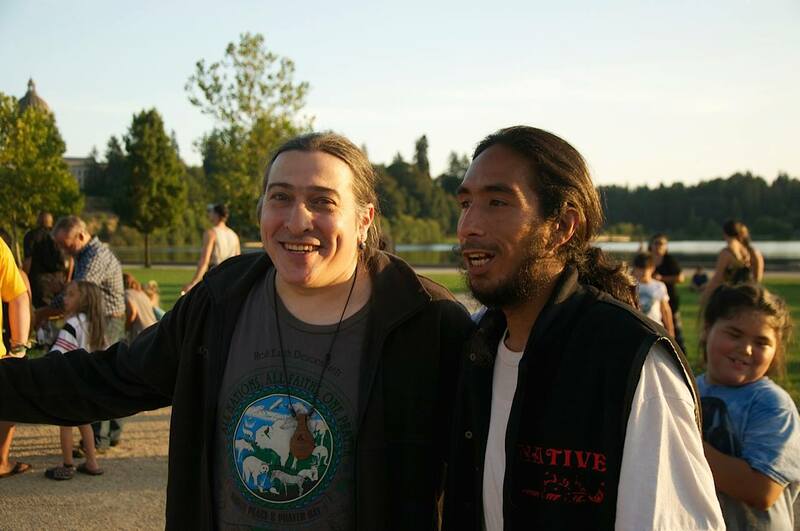 Falcon and Tyler live in Nisqually. This entry was posted in Make No Bones Shows and tagged Falcon Sison, KAOS 89.3 FM, Make No Bones About It, Nisqually Tribe. Bookmark the permalink.